I am jumping on the pantry bandwagon. 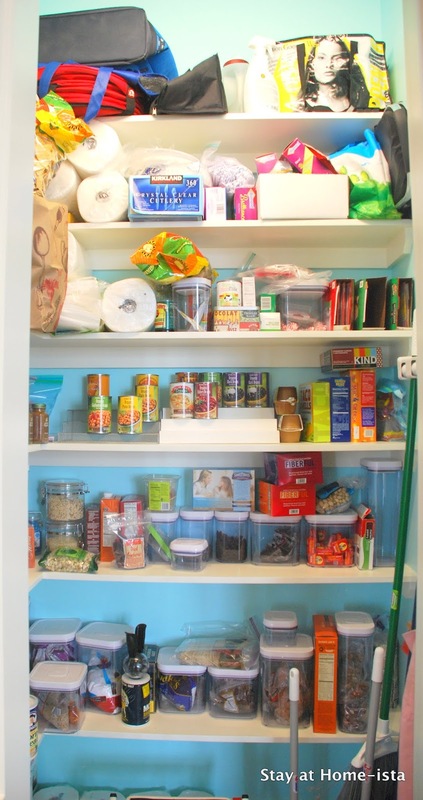 I want a neat and organized pantry too. Here is a quick peek of the vastly improved pantry. On the plus side, the pantry is painted a pretty Tiffany Blue (just like the library). The brooms are already hung up and off the floor (kind of gross to keep cleaning things in the pantry, but I need them close to the mess-making). I have everything I need to make it organized, the OXO pop-up containers, tiered racks for cans, now I just needed labels and to organize the space. I already have a spice drawer next to the stove. After discovering that I had marshmallows in two different containers that I could condense into one (we like to make s'mores in the living room fireplace, what can I say?) I set to work taming the chaos. 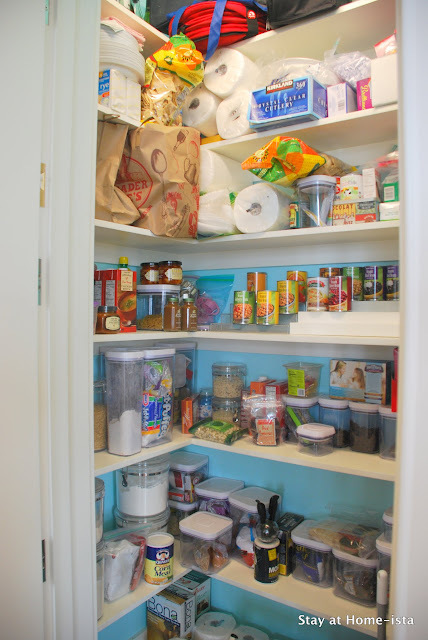 In addition to many things (you can see my blog goals here) this blog makes me actually organize my pantry, hooray! The well deserved after takes my breath away, there is so much empty space! Who knew a pantry could have clear shelves and empty bins? I too have been working on my pantry and really started using some containers to organzie materials. Let's hope it stays that way. Love it! Your little assistant is the cutest. 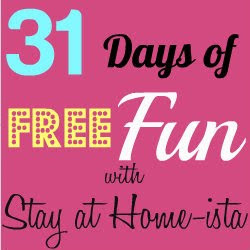 I'd love it if you shared this at Whimsy Wednesday at www.thenymelrosefamily.blogspot.com/2012/03/whimsy-wednesdays-2.html. I'm a sucker for organiztion. Looks good! I love the labels. Do you mind sharing where you got them? Oh snap. How much do you think your adorable little assistant might charge to come help me organize mine?? A clean and organized home makes for a happy mama! Love the container labels. Where did you find them? I am hitting up the pantry next! Love neatly labeled containers!! Great job! The labels are Martha Stewart, I got them off Amazon. My pantry is also do for a makeover, I will get to that next week, I love your glass containers, thats what I need to get and label all my things. You did a wonderful job. You are one organized mama and you cook quinoa - you are the whole package!! I need to get organized - leave it to a blog to give you a kick in the organizational pants! Looks great!! I wish I had a pantry I could pretty up!! Where's the band? What wagon? Did I miss it? PS-What IS all that coconut for? Such an organized and nice pantry! Jealous of you people having pantries! So nice and organized. Love the labels and the blue is fabulous! My pantry looks much like your before picture. I keep putting it off, but I think it's time! Thanks for the inspiration. Wow, that is beautifully organized now! I'm sure it was alot of work, but well worth it! Oh, I love an organized pantry. Looks good. Mine did not get finished this week, so on the list for the upcoming week. Loved your labels too. Those are cool! Love the style! Following from Sunday Social! ah, I saw need someone like you to inspire me into organizing. sadly, I am such a big mess when it comes to organizing as it is worsen by me not having time... sob, sob. Anyways, I loved how your pantry looks after your mini project ;-) love the labels too! I do not have a pantry but my kitchen cupboards need organizing tons! Wish I have a pretty pantry as you have. I have an old gross one and so need to re-do it. TY for sharing your beautiful home. Those labels couldn't be more perfect! It's something I definitely need to get on! 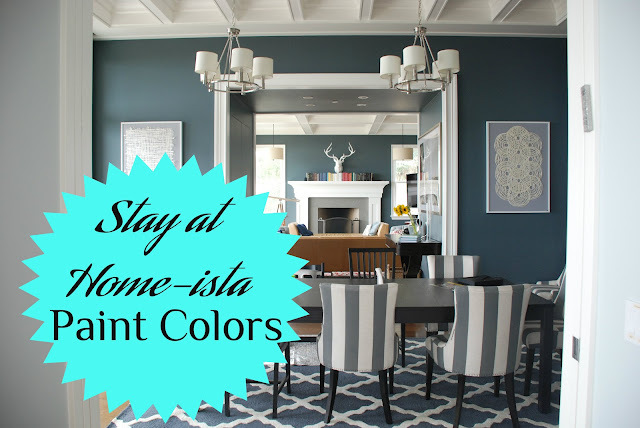 Thanks for supporting us by linking up to the Repurpose-Remodel-Reveal Transformation party! Wow! This is fabulous and so organized!! I love it! Looks good! I love the labels. Beautiful and neatly organized... Love the little labels that you have used..!! We are planning on redoing our kitchen (not nearly as gorgeous as yours seeing as it's about the 3rd of the size..yours is what dreams are made of...sigh) and I was wondering, where is your pantry in your kitchen and how what are the dimensions of it. Can you show a picture of it from further away? (I'm just trying to figure out what kind of style we're going for!) Thanks!